Tucked on the southern edge of the Mendip Hills, Wells (pop. 10,500) is England's smallest city, a priviledge acquired by charter in 1205 and that still applies today to this inflated village. 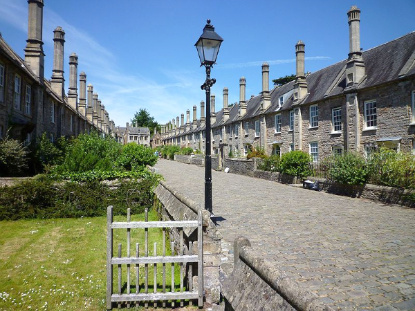 Wells's charm lie in its medieval architecture and cobbled alleys. It features Britain's smallest cathedral, a jewel of Gothic artistry. 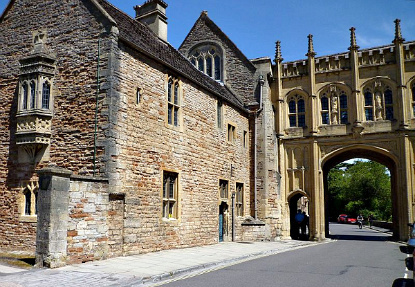 Wells' history has been linked to the city of Bath for 850 years, and the city remains to this day the official residence of the Bishop of Bath and Wells. Born as aminor Romans settlement, Wells got kickstarted as a town in 704, when King Ine of Wessex founded a minster church, which was to become the seat of the Bishopric of Wells in 909. 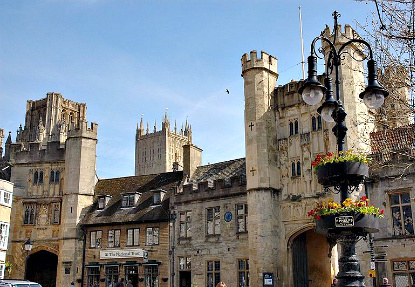 The diocese was transferred to the growing city of Bath in 1088, leading to bitter disputes between the religious communities in the two cities. Things got worse in 1197, when Bishop Savaric FitzGeldewin annexed Glastonbury Abbey and rashly renamed his jurisdiction 'Diocese of Glastonbury'. A peaceful resolution was found in 1245 when Pope Innocent IV compromised for the name 'Diocese of Bath and Wells'. The city's name derives from the three wells dedicated to Saint Andrew, one in the market place and two within the grounds of the Bishop's Palace and cathedral. During the English Civil War (1642–1651), Parliamentarian troops used the Cathedral as a stable for their horses and mutilated much of the beautiful sculptures by using them for firing practice. The cathedral was further damaged during the Monmouth Rebellion of 1685. The rebel army tore away lead from the roof to make bullets, broke windows, smashed the organ and stabled their horses in the nave. This culminated in the Bloody Assizes, when over 1,400 imprisoned rebels were tried and sentenced to death or transported to the West Indies as cheap labour. 300 men were hanged. The industrial revolution brought the railway to Wells. The city has had three railway stations, the first opened in 1859, but all had closed by 1964. Well's city status was confirmed and formalised by Queen Elizabeth II by letters patent issued under the Great Seal dated 1 April 1974. 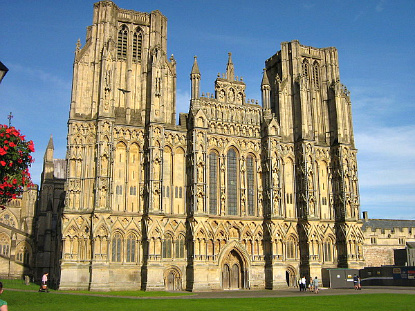 The city's grand sight is Wells Cathedral. Although diminutive by national standard, it dominates the landscape as it should. Built between 1175 and 1490, it has been described as "the most poetic of the English Cathedrals". The west front was completed around 1250 in the Early English Gothic style. It sports some 300 medieval statues, one of the finest collection of statuary in Europe (along with the Townhall of Brussels). The figures were originally painted and gilded. Vicars' Close, leading to the southern end of the cathedral, is claimed to be the oldest purely residential street with its original buildings surviving intact in Europe. It is a planned street built in all at once the mid-14th century. It has 27 residences (originally 44) and runs on 140 metres. Also of interest are the Bishop's Eye and Penniless Porch, two entrance gateways into the walled precinct that encloses the cathedral, the the 13th-century Bishop's Palace, and the 13th-century Church of St Cuthbert. Wells is located 35 km (20 mi.) due south of Bristol and 9 km (6 mi.) north-east of Glastonbury. There is no train station in the city, so the only way to get there by public transport is by bus/coach. National Express operates coaches from London (3h40min, £21.80), Bath (50min, £7) and Glastonbury (10min, £3.10). There are also frequent city bus services from Glastonbury (15min, bus No 163, 377 and 977).